An Amazon parrot is a classification of several different kinds of parrots that originally hail from the Amazon. These exotic pets are a long-term commitment, as they can live for up to 50 years. They are not especially hard to care for but do require some specific care needs and are only suited for the right households that are ready for a long-term commitment. Their natural habitat can range from South America to Mexico and into the Caribbean. In the wild, the Amazon parrot’s natural habits include savannas, palm groves, scrub forest, and rainforest. There are over 30 different species of birds included in the Amazon parrot family, but only around 10 types are common as pets. Because of their amazing coloring and remarkable ability to mimic human speech and sounds, they have become quite popular as pets. Many were taken from the wild and some species have become extinct and many are threatened because of poaching due to the pet trade. 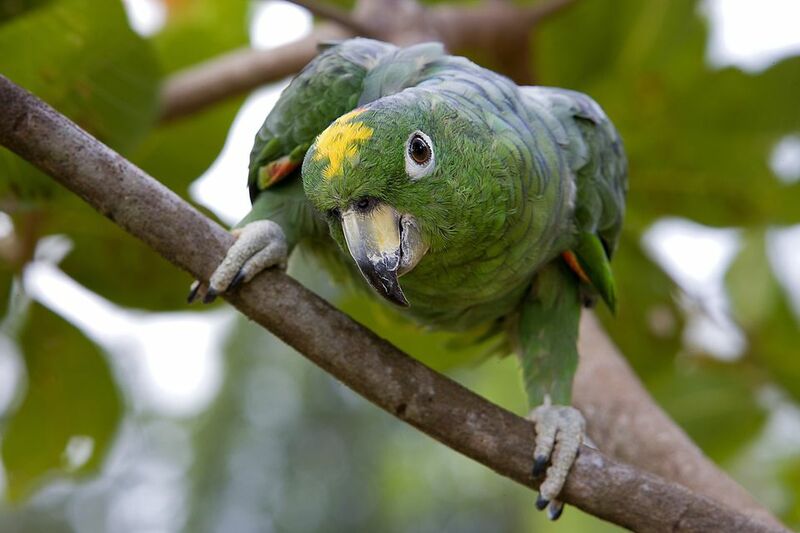 An international treaty at the Convention on International Trade in Endangered Species of Wild Fauna and Flora has made the capture of wild parrots for the pet trade illegal. This international attempt protects the wild populations. If you are purchasing an Amazon parrot, be sure to buy it from a reputable source or speak to a rescue organization that specializes in re-homing parrots. Depending on what species it is, Amazons are about 10 to 20 inches in length from beak to tail. They are medium to large sized parrots. All species of Amazon parrots are long-lived as most large birds are. You can expect a healthy Amazon to live around 50 years or even longer with good nutrition and care, so plan accordingly! Amazons are extremely intelligent and playful birds that love being the center of attention. They need lots of affection and time with their owners. They are curious, athletic, and seem to enjoy entertaining their owners with clownish antics. Amazon parrots are also considered somewhat moody once they reach sexual maturity and can become fairly aggressive if not trained and handled properly. Some male Amazon parrots can display "macho" behavior and strut around, show off their feathers, and pin their eyes. An Amazon parrot uses body language to indicate its mood. For example, an excitable Amazon parrot might be indicating that it doesn’t wish to be handled and failure to recognize this might result in a bite. Most Amazon parrots have a green body. Depending on the exact species, they have distinct feather colorings on their head and forehead. These colors can range from red, lilac, yellow, purple, and more. Others display various colors on their shoulders, tail feathers, and beaks. An Amazon parrot needs a spacious cage. Included in the cage should be toys and swings that are very spread out, as well as a play gym/play tree, climbing rope, or ladders to scale. This will all encourage movement and exercise. The minimum cage size should be 24 inches by 36 inches and 48 inches tall, with bar spacing of 3/4 to 1 inch. An aviary or safe free flight area is ideal. Before you buy a bird cage, learn more about your exact needs and make sure your house has the right setting for the cage. Being very playful, Amazons need lots of sturdy toys. Amazons particularly seem to enjoy toys they can manipulate with their feet. Think about bird toy safety when you choose the appropriate and safe toys. Plan to go through more toys than you can count over the lifetime of your bird. Besides the initial purchase of the cage and your bird, the bulk of your expenses will be and should be toys for your pet parrot. In general, Amazons are considered good talkers but some species (double yellow headed, yellow naped, and blue fronted) and birds that don't live with other birds are more inclined to talk than others. Keep in mind that even among species known for learning to talk that there will be individual differences so you should never get an Amazon or other parrot expecting it to be a talker. As for other vocalizations, Amazons can be quite noisy and loud. Amazons are also good screamers, though not as loud as cockatoos or macaws. Most Amazon parrots love to bathe. There are a number of ways to allow them to bathe, from joining their owner in the shower, getting a spray bath with a spray bottle, or jumping in their water dish and splashing water all about. Regular bathing is an important element to keep the Amazon’s feathers healthy. There are often Amazon parrots in rescue and adoption centers. Because of their long lifespan, many owners cannot continue to care for them and in some cases, the parrots may outlive their owners. Your Amazon should eat both pelleted bird food and healthy, fresh fruits, vegetables, and other "human" foods. Seeds are too high in fat for Amazons and while they can be fed as treats, they should make up no more than 10 percent of the whole diet. Nuts are a good treat but should only be fed in moderation. Parrot nutrition and proper diet is an important part of caring for parrots. An Amazon's love of food and its skills at begging often result in overweight pet parrots. A fun and well-stocked cage will encourage movement and exercise. They also are very intelligent creatures and need mental exercise. Puzzle toys are important to the parrot's mental stimulation.